Situated in the heart of historic Wrigleyville, we are the preferred destination for locals looking for one of the best bars in the vicinity. What’s more, The Graystone Tavern offers over 42 varieties of beers and ciders, as well as an impressive wine selection. Together with our vast array of alcoholic and nonalcoholic beverages, we also have an extensive menu, including nine specialty taco dishes, comfort food favorites, chicken wings and the popular Graystone Burger, among other choices. 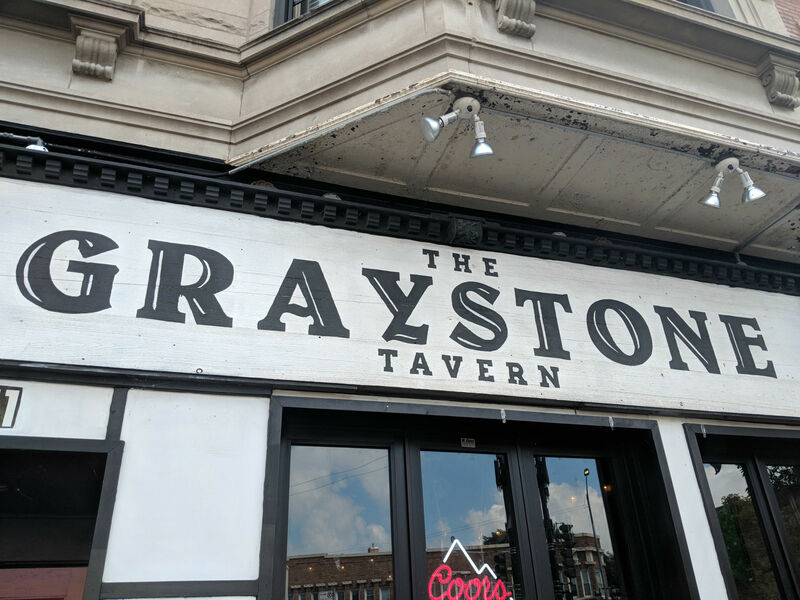 Consequently, whenever our Wrigleyville neighbors are contemplating a great night out at one of the exceptional regional sports bars, the only name they need to know is The Graystone Tavern! Wrigleyville is a neighborhood in Lakeview with close to 118,000 residents. It is named for its proximity to the iconic Wrigley Field, home of the Chicago Cubs. The Graystone Tavern is only a short distance from Wrigley Field. It’s not uncommon for Cubs’ fans to gather at sports bars, like The Graystone Tavern prior to the game, and then walk to the stadium. Or, when it comes to outdoor bars, we have a fantastic one that is just the perfect spot to congregate on warm summer evenings. Many Wrigleyville residents prefer to have us deliver to their homes, while others choose to call in to reserve a table. Finally, unlike many other bars, The Graystone Tavern is also available as a rental venue for charity meetings, celebrations, weddings and more. It is nice to know that you can always rely upon our remarkable staff to ensure that not only will we meet your expectations, but we will regularly exceed them. You can book a table, a room, or reserve the entire bar for your event. The Graystone Tavern is renowned for having a very inclusive and inviting environment, along with outstanding servers and staff, who will make certain your time spent with us is as enjoyable and affordable as it should be. We have an ample number of televisions throughout our facility, and in addition, just like in real estate, a big draw for The Graystone Tavern is its “location, location, location!” Our nearness to Wrigley Field is definitely considered as a great advantage for all of our clientele, many who are die-hard Cubs enthusiasts. If you are looking for a lovely, warm and inviting atmosphere to have dinner and drinks in Wrigleyville, stop by The Graystone Tavern at 3441 North Sheffield Avenue, or call us at: (773) 666-5450 to make a reservation. Hours are: Monday-Friday, 5 pm to 2 am; Saturday, 11 am to 3 am; Sunday 11 am to 2 am.